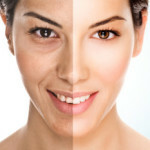 Age, sun exposure, genetics and life’s little vices can all take a toll on the appearance and texture of your skin. While cosmetic surgery can deliver dramatic, long-lasting results, surgical procedures are not ideal for everyone who visits our office. At Renue Aesthetic Surgery, we proudly offer a broad range of non-surgical options designed to improve your skin restore your youthful beauty. To learn more about the many skin care services offered at Renue Aesthetic Surgery, please call 913-685-1108 today to schedule a personal consultation. We welcome patients from Kansas City, Overland Park, Olathe and other nearby areas. Facial injectables: If you want to diminish the signs of aging and restore your youthful beauty, Renue Aesthetic Surgery offers a variety of facial injectable treatments, such as BOTOX® Cosmetic and Juvederm. Laser treatments – laser hair reduction: Advanced laser technology is a safe and effective method for achieving a number of aesthetic goals, including the removal of unwanted hair. Chemical peels: Made of special solutions that remove the damaged, outer layer of skin, chemical peels are an effective way to produce a refreshed, rejuvenated appearance. Microdermabrasion: This non-surgical procedure uses exfoliation to smooth the skin and reduce the appearance wrinkles, sun spots, acne scars and other aesthetic skin damage. PRP – microneedling: Using a small, pen-like device, micro-punctures are made in targeted areas of the skin, triggering your body’s natural healing process to firm and tighten the skin. HydraFacial: A small, handheld device delivers a soothing, hydrating facial that leaves your skin refreshed, smooth and revitalized. Grit is removed from pores, dead skin cells are exfoliated and the tissue is re-hydrated with nourishing serums. When it comes to the treatment of your skin and appearance, we want you to make an informed decision. During your skin care consultation, we’ll listen to what you’d like to achieve and then thoroughly explain all of your treatment options. The treatment options available for cosmetic skin conditions are always expanding, and each patient has unique needs. Through clear and honest communication, we strive to inform you about all of the options available to you and provide a customized treatment plan that is ideally tailored to fit your skin condition and lifestyle. If live in or around Kansas City, Overland Park, or Olathe and are ready to restore your skin’s radiant beauty, call 913-685-1108 today to learn how Renue Aesthetic Surgery can help.